Delicate and unassuming, the dainty carnation has become a traditional flower found in bouquets and flower gardens everywhere. Often called “pinks”, making reference to the pretty pinking shear type ruffles on their tightly clustered petals, these understated beauties are ideal for adding a touch of elegance to all of your paper crafting projects. 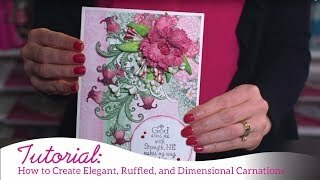 Filled with a multitude of petal and foliage sizes, this precisely illustrated cling stamp set when paired with the coordinating die allow you to create realistic and dimensional carnations in all sizes. This cling stamp set is part of the Camelia Carnation Collection and pairs with the Small Camelia Carnation Die.This stamp and die combination has been created for use with the Floral Basics Shaping Mold as well as the Deluxe Flower Shaping Kit.